The tour will follow the 4 week European "Digital Dictator Tour" of Europe this April. 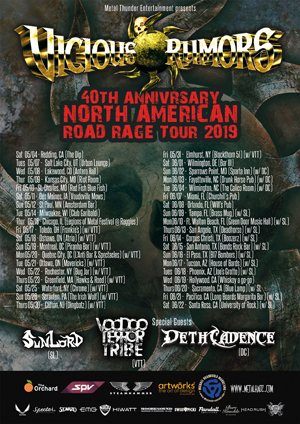 VICIOUS RUMORS will be performing in Spain, Italy, Switzerland, Germany, Austria, Belgium and the Netherlands. Some of the highlights will be the Delta Metal Meeting, Tattoo Fest and the legendary Full Metal Cruise.